One summer day, my stepmother plopped a roll of paper towels and a bottle of Windex in my arms and sent me outside to clean the windows. No vinegar or fancy squeegees or Miracle Cloths or sheets of anti-streaking newspaper for my family. Just me and my paper towels and lots of elbow grease. As I stepped out onto our porch and began spraying the large picture window next to the front door, an elderly couple who was visiting us at the time took their place inside the house at the same window. They proceeded to supervise my every move by shouting directions through the pane. I tried to ignore their muffled orders, since I was 15 years old and perfectly capable of cleaning windows all by myself, but they would rap the glass with their knuckles until they got my attention. They made sure to point out every spot I'd missed and motion toward the areas I hadn't yet reached. That dear little couple literally had nothing better to do that afternoon than ensure the windows achieved sparkling perfection. I was not able to appreciate their intentions. In fact, with each passing moment I grew more and more enraged . . . then defensive . . . then frustrated . . . then miserable, until I felt hot tears building . . . pooling . . . threatening to spill down my burning red cheeks. I put my stuff down and took a break. Perhaps they would grow weary of waiting for me to return to the windows and find a crossword puzzle to fill out or a cup of tea to drink or an afghan to place over their laps while they sat in a rocking chair. But noooooo. They kept a sharp eye out, and as soon as I returned to my chore, they took up their sentry position, bony fingers at the ready. My parents raised me right, so I managed to get through the next hour of cleaning every stinkin' window on the ground floor with those two old people bossing me around. I didn't sass back or stick out my tongue, although I did amuse myself by freezing my face in a big smile while whispering some choice words, ventriloquist-like, behind tightly clenched teeth. Cleaning windows while at the mercy of geriatric drill sergeants is an experience I wouldn't wish on a CEO from AIG. So why is it, that horrible day is what I recall when I look at this picture? 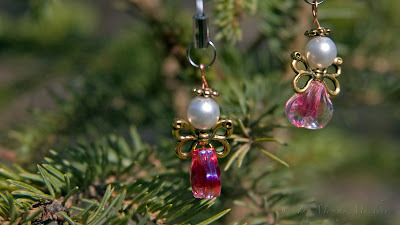 My mom handmade these tiny crystal angels, no bigger than the tip of your pinky, for each of my daughters. 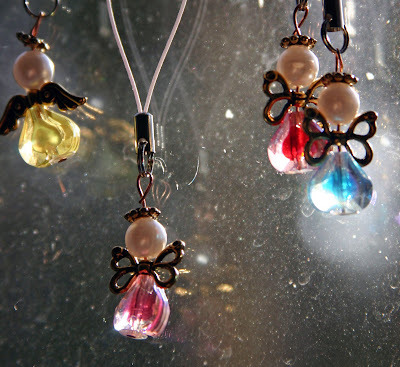 I hung them on a window that receives the morning sun, so I will be reminded each new day how precious and loved my girls are—by me, by Grandma, by God. Right outside this window is a lovely stand of trees, with a sweet baby spruce at the front. Wow, you are a window cleaning expert! Do you still use windex and paper towels only? Will you come to my house? I have a billion and one windows in this new house and I still have yet get them all clean! You are supposed to clean those?